Fortunately (or unfortunately), the POS wasn’t there. Julia Pierson at House hearing, Sept. 30, 2014. 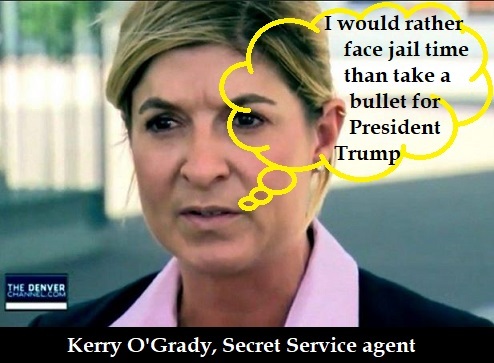 Yesterday (Oct. 1), after her appearance at a brutal House hearing the day before, in which she was grilled by Republicans and Democrats on how the intruder could have gotten as far as inside the White House, director of the Secret Service Julia Pierson, 55, resigned under pressure. Pierson is merely the tip of the iceberg of a Secret Service that’s in disarray, plagued by low morale, over work, staffing shortages, and the agents’ resentment at and “lack of faith” in their bureaucratic superiors, including “their senior-most leaders” — an oblique reference to the president himself. The 6,700-member agency, long an élite class of skilled professionals who prized their jobs, now suffers from diminished luster and historically high turnover rates. Officers in charge of protecting the White House say they have grown resentful at being belittled by their bosses and routinely forced to work on off-days. Some agents who have sworn to take a bullet for the president and his family have little faith in the wisdom or direction of their senior-most leaders. [,…] staffing short­ages have grown so severe that the agency has had to fly in field agents from across the country for two-week temporary details, paying their travel, hotel and per-diem costs. Julia Pierson having rejected an internal study’s recommendations that the White House have a total of about 100 countersurveillance officers to patrol the perimeter of the complex. Instead, she suggested cutting the recommended number by a third. She also decided to shrink key units in the agency, including the number of officers from the uniformed division who guard the White House complex. Lawmakers also grilled Pierson about a botched investigation of a 2011 shooting at the White House, details of which were first reported by The Washington Post on Sunday. Pierson said she knew little about the incident, despite having been the agency’s chief of staff at the time. Some lawmakers at the House hearing on Tuesday noted what they said was a broken culture within the Secret Service. They pointed to a young officer on duty the night of the 2011 shooting who heard shots fired and debris falling but was afraid to contradict supervisors who had incorrectly concluded that no shots had been aimed at the White House. Several House members said they had been hearing from agents and officers who do not feel they can make their concerns known internally. Eleven agents were put on leave in 2012 after allegedly hiring prostitutes in Colombia. In the meantime, Joseph Clancy, a retired agent who briefly served as the head of Obama’s protective detail after he was first elected, was named to take over the Secret Service on a temporary basis, while a full review of the Secret Service is conducted and until a permanent replacement can be found.